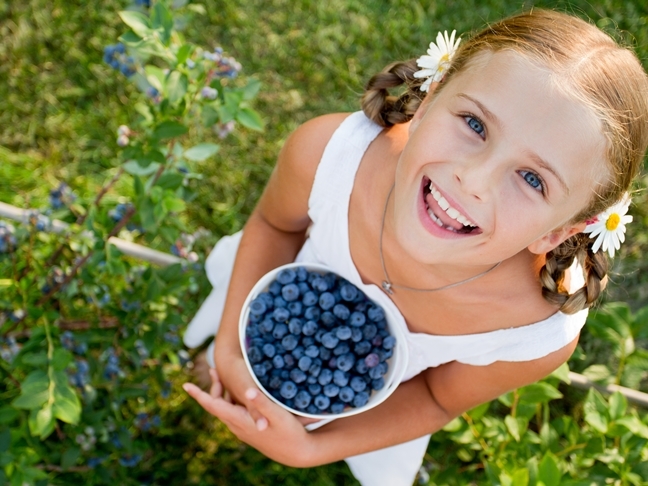 One of my favorite summer activities is berry picking with the kids. When I was little, my parents used to drag us all to the u-pick fields where we’d hunch down and pick strawberries as fast as our little fingers could go, all while under the watchful eye of the field owner who frowned on our eating any of the sweet red berries before buying them. I remember picking flat after flat of the juicy strawberries, my fingers stained and my stomach empty. We’d take them home where we’d gorge on them while Mom made enough strawberry jam to keep us in PB&J’s for the year. Berry picking today isn’t as regulated. The owners of the fields smile and wink at my little ones and say, “Remember to get at least a few into your buckets!” The fields, while still under a blazing sun, are covered in netting or at the end of a long hay ride. It’s more of an “experience” than a job. And how my kids love it! I took them ollaliberry picking over the weekend. While yes, it’s an “experience”, I still have my mother’s frugal homemaking genes running through my veins. While they pick and eat and pick and eat, I calculate how many pints I need to make jam that will see my children through a year of PB&J’s. This weekend, we picked until our fingers were stained purple and our hands were scratched from the thick brambles. We picked until I eyed the pints and decided we had enough. And then, we loaded up into the car, covered in sticky berry juice, and drove home where they ate some more and I filled jars with brilliant hues of purple fruit. They can’t wait to go again. Vintage CraftingPuppies and Kittens, Oh No!